1. My dad reminded me that my blog has not been updated in three weeks. To which I replied that no, I have not written much but since March 3rd I have vacuumed my house at least 12 times, cleaned the bathrooms every second day and basically followed behind my kids with a broom and scrub bottle. 2. No, the house has not yet sold. Why do you ask? 3. Spring finally got the memo and showed up in these parts. Yesterday we got up to 7C in the sun. Which means that pretty much everyone is in shorts and the hoochie momma tops are out in full force. After 20 minutes in Walmart I wanted to go and scrub out my eyes with bleach. Parkas can be a blessing in disguise sometimes. 4. I have discovered a new recipe site. Soooooo good. Healthy food that actually tastes good. Way Cooler has only grimaced and blanched at one of the recipes that I have foisted at him. Which for Way Cooler is a bit of a record. 5. I just finished reading "Invisible Chains" by Benjamin Perrin. I totally recommend it. It is a concise look at human trafficking and what ordinary people can do about it. While it was written from a Canadian perspective there is still lots of good information in it no matter what country you live in. Read it. Read it. Read it. I may be silent again a bit on the old blog as I find myself with a lot of letters to write now. 6. WARNING: SHAMELESS NAME DROPPING AHEAD: I used to babysit the author. He was a bit of a brat back in the day. Has totally redeemed himself now by becoming so invested in stopping this shameful, shameful industry. 7. We started Spring break this week with the world's shortest bout of the stomach flu* (NOT COMPLAINING) and based on the coughing last night appear to be ending it with croup. Spud may never want a school holiday again. *They were each sick for three hours and then ALL WAS WELL. It was utterly bizarre. NOT COMPLAINING. 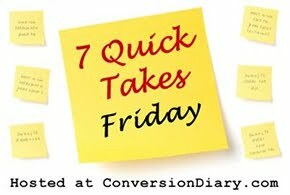 For more quick takes from bloggers who you know, actually blog visit Jennifer at Conversion Diary.